Frontiers looks really neat. 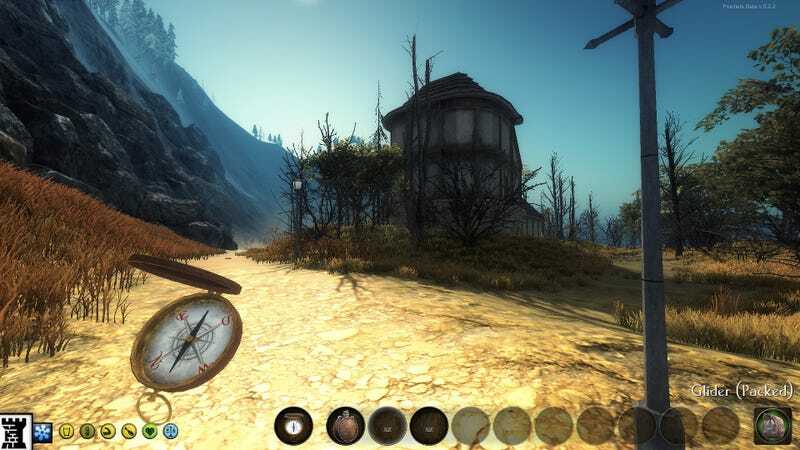 The just-released-on-Early-Access fantasy RPG contains shades of The Elder Scrolls, especially Morrowind and Skyrim, but with an emphasis on exploration over combat. The game's creator, however, doesn't want you to give it to friends as a Christmas gift. He was adamant about that. "A lot of folks have told me: I'm buying this game for my kid/friend/spouse for Christmas, they love exploration games! And I say the same thing every time: DON'T!" "The only people who will love it are players who seek it out for themselves, because it's NOT FINISHED. Your kid/friend/spouse will just be annoyed with you. I'm proud of this game, and with everyone's help I believe it's going to be great - but it's not great yet, so in the meantime get your kid/friend/spouse Dragon Age or The Binding of Isaac or something, trust me." If you want to buy it for yourself, go nuts, he added. Just know what you're getting into. This Early Access release is about stomping bugs and glitches until they're puddles of pixelated goo. Frontiers currently contains a lot of the final version's content (two of the story's three acts, lots of open regions to explore), but it's definitely buggy—as many Steam reviews attest. Still, it sounds like the core of something good is there. You can decide for yourself if you want to check it out right here. I'm glad Simkins is being this honest about the state of his game. Seeing Early Access games pop up in Steam Sales (or even just on the front page) with minimal Early Access signposting makes me feel a bit misled. Moreover, Early Access can mean anything, from nearly-complete to a total mess. So long as Valve won't revise the system to make things a little more obvious, it's good to see developers like Simkins alerting people wherever they can. Yeah, an extra post on a store page (read: not the front page) where there's already an Early Access label isn't much, but every little bit helps. Sometimes it's the thought that counts—or at least the philosophy driving it.